Shopping for Ninjago Construction Toys? Hurry to the Vermillion's spooky swamp fort where Time Twins Acronix and Crux have captured Master Wu. Dodge the Snake Mech's dangerous swishing tail and eye missiles. Evade the egg falling from the fort's roof and free Wu from the prison. But look out—the Time Twins have got all four Time Blades and are plugging them into the mech's Time Portal. Stop them before they spin that portal and take control of time! 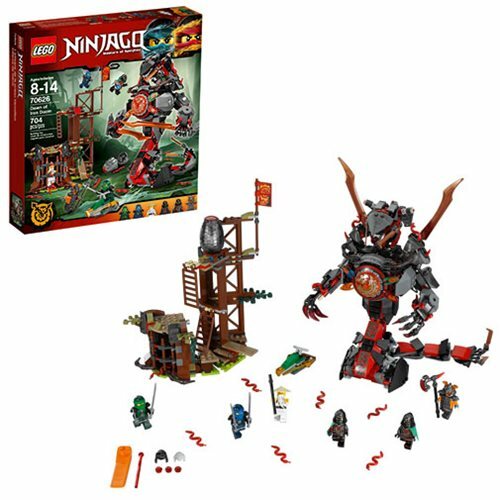 The LEGO Ninjago 70626 Dawn of Iron Doom includes 704 pieces. Ages 8-14.